Your important information saved in computer can be a victim of spam anytime. In such condition, you will not have access to your data and it will become a memory of the past. I’m sure that you would not like to be in such condition. So taking backup of your data from time to time is really important.To be on the safer side, you can take backup of your data both by offline and online ways. But I would recommend you to proceed with the online backup method. Here’s why I am recommending to go for online backup. Everyone wants to work less and get more. This is what you get with Online Backup process. The whole process is automated. You don’t need to take backup of data from time to time, in a manual way. Online backup does the whole work automatically. 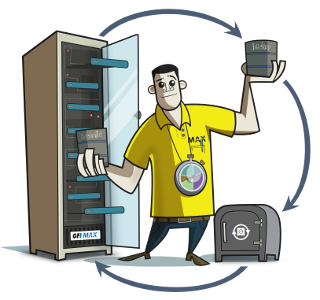 You can set the options in online backup service to take backup of your data on hourly, daily or even monthly basis. Safety is what we need the most when it comes to our important data. Online backup ensures the proper safety of your data. This is done by setting a password for your account. With online backup, the complete privacy of your data is in your hands. You don’t need to worry about the safety of data. The notification via email on the new files’ add-up, deletion etc. keep you updated with the activities going with your account. The whole process of taking backup of your important files and then accessing them, all are fast with the online backup. The fast speed in online backups save a lot of your important time. You can upload files, can take backup and in case of your data lose, you can restore it at blazing fast speed. With online backup, you can access your data from any corner of world. You only need to have your online storage service’s username and password. You can even download the data anywhere and anytime you want to. Yes, it’s possible with online backup. Most of theonline backup services supports the mobile web and thus allow you to access your data, while on the move. Many online file storage services have their own apps for all major mobile operating systems. Restoring the data is very simple with the online backup. You can restore the data either by going to the website and then restoring it or using the desktop client to perform the task from desktop itself. In the end, we can’t opt for any service after seeing its features. We also need to look at the cost of service. The online backup data service is provided at cheap and hard to believe price. It was the list of some benefits of using online backup. Now the choice is yours – Online Backup or Offline? You’re absolutely right. Our computer-stored data are always at risk of getting spammed, and we need to protect it. With having online backup, we would be able to do just that. Another cool advantage of online backup is that while restoring data you can select from many different versions – the version you’ve had yesterday up to months ago. More like glimpse of the past, that’s cool, right? 😀 And you can possibly restore these versions to any location on your hard disk or network.